It's Monaco, baby! Who doesn't love Monaco? Okay, you can argue that the racing often lacks that special something, but there are usually enough incidents to keep a race weekend exciting. Just because you have to look really hard to spot an overtaking move doesn't mean that progress can't be made - where else could a driver crash into the barriers, pit for a puncture, be thrown towards the rear of the field and still come through to take victory? It's seductive, sparkling and special, it's the sixth round of the season. We've seen Mercedes dominate this year, barely letting anyone else get a glimpse of the top two finishing spots. That's unlikely to change going into this weekend, but the battle between Hamilton and Rosberg brings its own brand of entertainment. We saw the level of mind games and inter-team rivalry take a step up in Spain, and as Monaco is Nico's home race, there's probably going to be more here as the stakes are raised. Elsewhere, Ferrari are still desperately trying to recover from a bad start to the season, as Williams also look to get back on track. Lotus showed improved form over the last weekend, but there are already plenty of jokes circling regarding the ability of Pastor Maldonado to get through this race weekend unscathed. And, of course, the battle of the backmarkers continues to rage, with the balance swinging in Marussia's direction at the moment. Support racing for this event includes Renault 3.5, GP2, and Porsche Mobil 1 Supercup. Monaco's practice takes place on Thursday rather than Friday, meaning the sessions could catch some of the rain hovering around the principality during the mid-week. Towards the weekend, things should clear up with Saturday looking to be the best day weather-wise. On Sunday, the clouds move on, and there could be a chance of rain, but forecasts suggest otherwise. 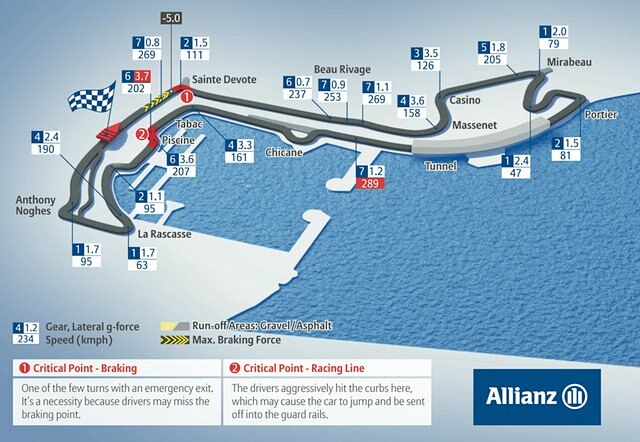 The Monaco Grand Prix is a race of precision and endurance, with drivers forced to up their concentration levels to avoid the barriers and deal with the quickly arriving corners. Each lap is an intense fight for the driver, no time to take a breather, facing some unique challenges along the way - the hairpin, the tunnel and the Swimming Pool chicane. The lap is short, and begins with the run to Sainte Devote, a tight right hander that leads to the uphill climb following. The walls close in through the second sector, the action slows and winds down towards the tunnel, where things pick up. It's one of the fastest points on the circuit, with drivers having to exit the tunnel, blinking into the sunshine, and immediately deal with the Harbour chicane. Through the final run of corners, round Rascasse, and then they're heading for the start/finish line. The challenges presented by Monaco mean drivers often get it wrong, and there's an 80% chance of at least one safety car in the race. The top speed is only 280 km/h, whilst the longest straight is just 669 metres, and full throttle is estimated to be just 30% of the lap. Monaco celebrates hosting the 61st edition of their F1 Grand Prix this year, and the track has evolved since its earliest day. Although being set in the streets of Monte Carlo has limited the amount of adjustments that take place, safety precautions have been one of the key factors when it comes to upgrading the circuit. It's been a long time since the harbour was lined with hay bales, proving an ineffective way to keep drivers out of the water. Of the last five races at Monaco, three were won by Red Bull. Sebastian Vettel only took one of those, struggling around the principality compared to teammate Mark Webber. Overall, McLaren have a good track record with fifteen victories, but Ferrari and Lotus have also had success at the principality. Last year seven drivers failed to see the chequered flag, and the year before it was nine that dropped out before the end. The race really can be one of attrition rather than out and out pace. As the slowest circuit of the year, the tyres don't have to be quite as durable as at other times, and Pirelli have opted to bring the two softest compounds to Monte Carlo. 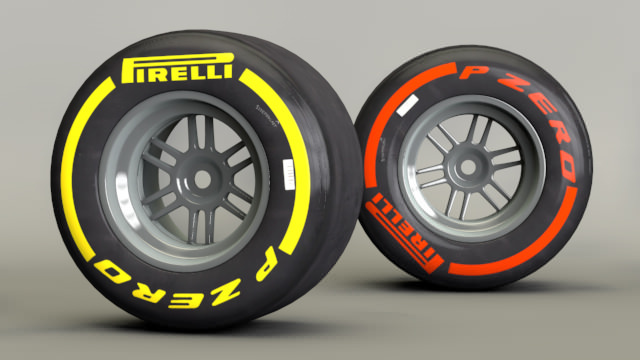 With the soft and supersoft tyres on offer, the Italian manufacturer is hoping they will see quick tyre warm-up and maximum adhesion, as navigating the corners safely is the best way to get good performance during the weekend. Monaco is obviously a showcase event for everyone involved in Formula One, with a unique atmosphere and a special challenge that you just don't see anywhere else. The supersoft tyres make their debut in Monaco, which like all our 2014 slick tyres have new compounds and constructions this year, designed to improve durability. Wear and degradation is traditionally very low in Monaco, so it's possible to do the race with just one pit stop. José Abed FIA Vice President, founder and president of the Mexican Organisation of International Motorsport.